Such an amazing place to view the aurora right over your head! NO need to book aurora tours. Great viewing from August to mid-April. Very unique and comfortable off-grid living in your own private suite and deck! Enjoy the peace and quiet that on-the-water-living affords! An anchored B&B houseboat in the middle of Houseboat Bay! We provide you with a canoe after your initial pick up with our power boat. Start your busy day with a hearty breakfast that we provide ingredients for - in your private kitchen. In the summer, laze around on the deck with a drink in hand, or go for a canoe ride whenever you feel like it. Swim right off your own deck! 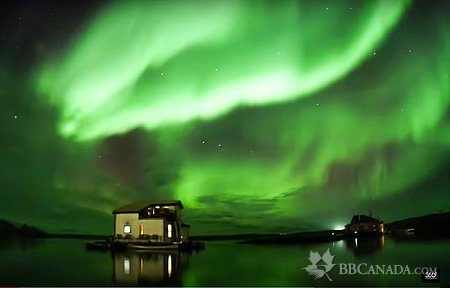 Take amazing aurora photos from late August to mid-April, right off your deck! It’s all around you at Mo’s Houseboat B&B! Cancellation : Your deposit will be refunded minus a $100 cancellation fee if within 4-8 weeks of your reservation date. Full refund within 2 months. Within a month, no refund. Seasonal Information : The shoulder seasons for ice conditions are approximately end of October to mid-May. Please call ahead if you are interested in booking within these months.